First, let’s delight in the title of this book. I love this title, and think it suits the book perfectly. ‘Heave’ implies a weighty subject matter. ‘Heave’ leads me to imagine someone pitching something away, in this case an old crappy life in exchange for a new one. As the protagonist is an alcoholic, there is literally quite a lot of ‘heaving’ in this book. And, finally, I have read that the author got the title from the lines in ‘Farewell To Nova Scotia’: “For when I am far away on the briny ocean tossed, Will you ever heave a sigh and a wish for me?“. Perfect. Although, I think what Serrie needs is to be able to ‘heave a sigh and a wish’ for herself. Dearie was right, way back then: nothing would ever be the same again. But that’s life, nothing ever stays the same, not the small children or fishing villages, or boats and hearts that bounce on the Bay of Fundy waves. White vans will never fly, and little girls will never be mermaids. You never know when the timer’s going to ring. At the tender age of 20, Serrie Sullivan is having a rough time of it. Conlin grabs your attention right away with Serrie running away from her wedding and hiding out in one of her father’s old outhouses. This is our first impression of Serrie, and it’s not an altogether flattering one. “Flaps of dress fluttered as I ran down main Street, pulling at the ripped bodice, shedding pieces of silk until there was the red bra that I had worn, the only vestige of the rogue I had thought I was.” The rest of the book tells us how she ends up at this point in her life; at this wedding that she decides is not for her. I don’t always enjoy books with young protagonists; they often end up frustrating me, making all the wrong choices until I feel like shaking them. But, despite all the poor choices, bad attitude, and endless smoking, I love Serrie Sullivan. (Also, great name – Seraphina Islay – named after her Scottish Grammie.) She’s miserable, she’s at the end of her rope, and she knows it. One thing she has never learned how to do is to love herself and to trust herself. But, how do you do that once you’ve hit rock bottom; where do you go from there? Heave takes us on her long and bumpy journey back to herself. I can’t imagine what it will be like, not drinking, but anything will be an improvement, even just being sober and sitting quietly in Meetings until I grow old and die. It’s hard to imagine anything more at this point. Let’s talk about Grammie. Grammie is the backbone of Serrie’s floundering family. Her family has its problems, but they still care about each other, and Grammie is the glue that holds them together. She’s also the one who is there for Serrie when no one else is. She is in Serrie’s head throughout the whole book, saying things like “other folks will think what they think“, “life is what you make it“, and “we have to try to love the ones who are hardest to love“. As Serrie sits in that outhouse after running from her wedding, she has a whole conversation with Grammie in her head. Serrie: … doing something you’re not supposed to do always makes you feel better. Maybe that was my problem, I was always doing stuff I wasn’t supposed to do, always trying to feel better. Serrie: But look at what I am, I tell Grammie. I’m a twenty-one-year-old drunk with no job. Grammie: Well, now, there’s plenty worse things to be. Serrie: “Oh, like what, Grammie?” I yell it out the door, wishing I had a smoke. Grammie: Like a leper or a goddamn pervert or a hypocrite or a liar. My personal favourite Grammie moment happens when a mother complains at Bible Camp that her child is bringing home pictures of a brown Jesus. It was early, and we were all just arriving… But Grammie wasn’t sleepy, not one bit, as she told Mrs. MacDonald that Jesus of Nazareth was dark because he was born in the Middle East, not Iceland, so she should go home and stick that in her head in place of whatever nonsense she had in there now, and she might also find it helpful to read through the Bible with a map handy, so as to avoid having to harass a poor high school student who was just trying to do a good and accurate job. But, in the end, she is not saved by Grammie, or her friends, or her parents, or Earl Grey the cat, and certainly not Hans; she does it herself. And, not only that, but you don’t get the sense that she’s ‘saved’, because that would feel silly and unrealistic; you just get the sense that she is finally beginning to accept herself, to feel like she is capable of making her own choices, and that maybe she doesn’t need to be afraid of everything anymore. She still has a lot of life-crap to sort through at the end of the book, but she is on the right road for sorting it out. There are so many passages and snippets of sentences from this book that I want to share. I’ve tried to cut back, but I love them all. Here is my attempt to consolidate them. I don’t know why and maybe I never will know why, but I have no desire, no urge, no nothing to drink. The passion is gone, that special feeling, and I could almost cry from the emptiness. What comes after this? … enveloping me in the sweet and squashed miasma of my life. … all those days we live weave and fold together, we make those days and they in turn make us. There is nothing rational about doing what everyone else wants you to. … these days every bit of kindness hurts, my achy feelings plastered over my flesh in bruises. The clean flannel nightie my mother has laid out on the bed smells of fresh air – it’s another one I haven’t worn in years, clothesline dried so stiff it could walk around the room, go down and have a chat with the tree probably. I roll around in the bed until it’s soft and cozy. It was the Foster First United Church, in old-style Nova Scotia, where change is slow like winter and tradition as strong as the forty-five-foot tides of the Bay of Fundy. When it’s summer in Nova Scotia, you can forget winter even exists; it stops even being a memory, and becomes a story people tell, like a fairy tale, the white days of bitter ice. That last quote made me realize one of the reasons I loved this book and Conlin’s writing; her way with words and her ability to say what I think even though I didn’t know I was thinking it. I was constantly (figuratively) nodding my head as I read along. Even though my own experience is far from Serrie’s (really far), I was able to ‘get’ her; I get how it all happened. And it’s so easy to understand how she doesn’t even get it, how she doesn’t want to even think about it; the confusion and the shame. And, she does it all with a sense of humour, so that you can laugh along as Serrie tells you her less-than-exemplary life story. If you skipped all the quotes and came straight to the end, I forgive you, but I can only assume it’s because you’re heading straight to the store or the library to find this book. 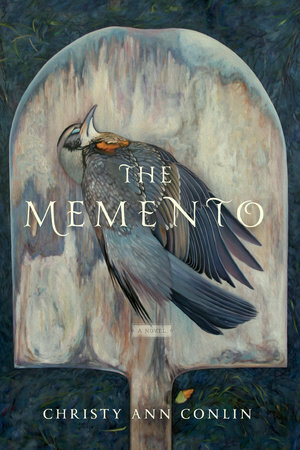 While you’re at it, she has a new book out called The Memento; get that one, too. 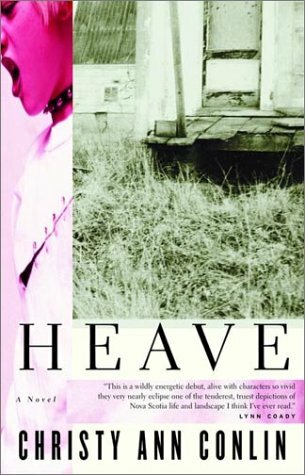 Heave was a Globe and Mail “Top 100” book, a finalist for the Amazon.ca First Novel Award in 2003 and was shortlisted for the Thomas H. Raddall Atlantic Fiction Award and the Dartmouth Book Award. It was also longlisted for the 2011 CBC Canada Reads Novels of the Decade. Christy Ann Conlin is a writer, editor, broadcaster, rose enthusiast and motivational speaker who lives in a charming house in Nova Scotia’s historic Annapolis Valley. The Memento tells the story of one of the minor characters in Heave. Even though I would love to read this book now, I don’t know when I will actually get to read it, but for those of you who are interested right now, here’s an interview with Shelagh Rogers about Conlin’s new book, in which she talks about ghost stories and rural Nova Scotia. Have a listen! Skipping those quotes would be a shame – many of them are so vividly expressed. Sounds like an intense novel. Running away from the wedding and hiding in an outhouse intrigues me from the start. Glad this ws a good read for you. Both the start and the finish of this novel were very strong, I thought. The ending had me immediately going back to the beginning to see if I could pick up on anything new, in light of how it ends. I read The Memento first and I liked it so much I started reading Heave right away. How did I miss that one when it was published in 2002?? I loved both of them. I think you’ll enjoy The Memento! It’s beautiful and terrifying. I’m so glad you liked The Memento! Grammie sounds amazing – love the old ladies who don’t give a sh*t anymore, so they say what they want, and it ends up making the most sense of all! Gosh, I’m not so sure I want to read about someone hitting bottom. It’s kind of rough at times, but darkly funny too, so it’s not so bad. But, that’s just me! This sounds excellent! Adding it to the TBR. Hmm this sounds a bit like a Nova Scotia book I read a few years ago, From Away, but grittier. Which is a good thing ☺ I do love a good book about alcoholism. I haven’t read From Away, but Heave is definitely gritty. And, the alcoholism was different than a lot of others I’ve read, I think because the protagonist is so young. It’s not a quick read, but I enjoyed every minute of it. The quotes you selected are so insightful – I love those books where I feel like I have to write down every other sentence in my journal to savor and reflect on. The second one on alcoholism is so powerful, and so devastatingly accurate, from my experiences with those struggling with addiction. There were so many lines and paragraphs that I wanted to save to remind myself of later – lots that didn’t make it into the review. This was a library copy, so maybe I just need to buy the book! I’m going to check my library to see if they have this book. It sounds gorgeous. I’d never heard of Christy Ann Conlin before this post, but your excerpts have me itching to seek this one out. I spend a lot of time thinking about addiction and the ways in which we stigmatize and don’t effectively help addicts in American society, and this sounds like such an honest and respectful portrait of a person struggling with substance abuse. Also, I can’t help but love Grammie already. P. S. I heard a news segment today about a new alcoholism treatment program in Canada in which residents are given hourly (or less frequent, depending on their needs/desires) pours of wine to help manage their addiction while getting other aspects of their lives on track. Have you heard of it? It sounds like an amazing step in the right direction! That sounds interesting! I haven’t heard of that – I’ll have to look into it!